When Samsung announced the Galaxy TabPro S, it made headlines not only as the first hybrid from Samsung, but also as the first Samsung device running Windows 10. With past devices, Samsung has held tight to Android, usually layering a skin over the stock version to make it a unique -- and sometimes frustrating -- experience. This time, Samsung opted to equip its latest flagship with Windows 10, and left the OS mostly alone save for a bit of standard Samsung bloatware. As hybrids enter the workforce, more companies are jumping on the hybrid-bandwagon, which has been popularized by Microsoft's dedication to its Surface lineup. Creating a device that can function both in the enterprise and on a consumer level hasn't been easy for most manufacturers, and Microsoft had to iron out a lot of kinks before the Surface really took off. The Galaxy TabPro S shows Samsung has obviously learned from other company's mistakes to create a device that shows the company has every intention of getting into the enterprise. It is nearly impossible to talk about any hybrid device without instinctively comparing it to the two most popular hybrids currently on the market -- the Apple iPad Pro and Microsoft Surface Pro 4. With a 12-inch display, the Galaxy TabPro S is the same size as the Surface Pro 4 and .9 inches smaller than the iPad Pro. And weighing just 1.5 pounds and measuring 0.25 inches thin, the Galaxy TabPro S is similar in size and form factor to the Surface Pro 4 and iPad Pro. It's a sleek and attractive device that slightly resembles the iPad Pro. Compared to the keyboard on the Surface Pro 4 and iPad Pro, the proprietary keyboard from Samsung doesn't feel as natural and the keys feel cramped even though it's a full keyboard layout. The key travel is also a bit shallow, resulting in a mushy feel when typing; and since the keys aren't spaced far enough apart, you'll find yourself making more errors than on the Apple Smart Keyboard or Microsoft Type Cover. However, these pain points become easier to ignore once you find out the keyboard comes free with the device -- you have to purchase the Microsoft Type cover or Apple Smart Keyboard separately and each cost over $150. For those who aren't happy with the keyboard that ships with the device, you can always opt to purchase a third-party keyboard to replace the Samsung version. But while the keyboard isn't the best experience, the trackpad will more than suffice; it's responsive and spacious, and shouldn't cause any issues with productivity. Where Samsung's keyboard really wins out over the options from Apple and Microsoft is how solid it makes the device feel. Picking up the Surface Pro 4 or iPad Pro to move it to a new location takes a bit of care, you can't just pick either device up by the base and walk away. With the Galaxy TabPro S, you still won't want to grab it by the keyboard, but it's far easier to carry with one hand without closing the lid onto the keyboard. It's a small difference, but for anyone that's stood up too quickly with a hybrid sitting on your lap, you'll understand the importance of overall stability in a hybrid device. That extra stability in the keyboard does make it a bit thicker and heavier than the Type Cover or Smart Keyboard, adding some minor bulk and weight to the device when the keyboard cover is shut, but it won't hinder the mobility of the device. One issue with the keyboard stand is that Samsung didn't seem to consider how frustrated early adopters were with Microsoft's original Surface, which only had two viewing angles. The Galaxy TabPro S has two viewing angles, and one of them seems so impractical I'm not sure when it would be used -- the screen lies so far back, I'm not sure when it would come in handy. And the one usable viewing angle can get frustrating quickly if you're not sitting at a desk or table -- you won't get the same flexibility and customization that you can get with the Microsoft Surface Pro 4 stand. It's still not a deal breaker by any means since the keyboard case comes with the device, but power users might find themselves looking for a new keyboard option pretty quickly, so it's important to consider the added cost. The Galaxy TabPro S houses an Intel Core m3 mobile processor, 4GB of RAM and 128GB of SSD storage, which is really the absolute minimum specs you want for business use. Nothing kills productivity more than slow loading websites and freezing programs, but with 4GB of RAM and a mobile processor, you'll be able to keep multiple tabs, programs and apps open at one time without over-taxing the system. For the casual to average business user, this should offer enough performance to get work done, but it might leave power users wanting. If you deal with more intensive and taxing programs on a daily basis then you might want to opt for the Surface Pro 4 lineup, which can be configured with better and faster processors -- for a premium, of course. Battery life on this device is strong, which is an important feature for any enterprise device. You can get nearly 10.5 hours on a charge, and with the quick charging capabilities, you can get your battery back up to 100 percent from dead in just 150 minutes. The battery life on the TabPro S will get you from morning to evening with typical use no problem, without worrying about searching for an outlet. The display is gorgeous, with a resolution of 201 ppi, which is lower than the Surface Pro 4 and iPad Pro, which have resolutions of 267 and 265 ppi, respectively. Even though it has a bit lower resolution, the AMOLED display still looks great and you won't have any problems reading small text. It's a great display whether you're working on a spreadsheet, video chatting with a colleague or kicking back to watch Netflix once the work day is over. When it comes to a tablet designed for business, most users want an experience as close to a notebook as they can get, especially when it comes to connectivity. Samsung missed the mark a bit here as the device lacks the ability to easily connect it to an external display. There is a USB Type-C port, so you can always get adapters to connect it to an external display or to add a full USB port, but for a device that's designed for mobility, the idea of toting around extra cords and adapters might not appeal to most people. For business users, a USB-C Type connector might be frustrating for workers who are accustomed to the wealth of ports on a traditional notebook. Business users typically want connectivity -- whether it's to another display, a wireless mouse or external hard drive -- and USB-C Type connectors don't easily allow for these extra peripherals. Windows 10 shines on a hybrid device, offering a balance between a desktop and tablet experience. Microsoft has worked hard to improve on the OS since Windows 8 fell flat, and it's paid off. 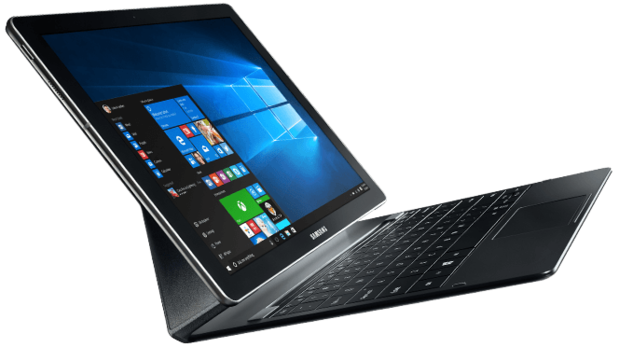 And the fact that the Samsung TabPro S runs Windows 10 will be a big draw for businesses, considering the built in security and enterprise features Microsoft packs into its operating system. For businesses already invested in the Microsoft ecosystem, the TabPro S could become an alternative option to the Surface Pro 4. For companies that decide to deploy the Galaxy TabPro S, they'll get the advantages of the Samsung Enterprise Device Program. This program includes monthly security updates and the ability to purchase the same device for two years after its release to ensure employees are all operating on the same hardware. As with other Samsung devices, the Galaxy TabPro S also comes equipped with Samsung Knox, which is the company's enterprise grade security feature. The TabPro S also ships with Android for Work, which makes it a great option for anyone looking for a business and personal device. With Android for Work, users can create two accounts, one for business and one for personal to keep both secure. In terms of performance and portability, it's on par with the iPad Pro and entry level Surface Pro 4 model, so you won't make any real concessions there. The biggest draw of the Samsung Galaxy TabPro S over the iPad Pro or Surface Pro 4 is the price point. For the device and keyboard, it's just $899, which is the same price as the entry level Surface Pro 4 without the keyboard. The iPad Pro with 32GB is actually less expensive without the keyboard at $799, but you'll need to tack on an extra $169 for the keyboard and most business users will want to upgrade from 32GB for more storage, which will increase the price at least another $100. It can be difficult for a hybrid tablet to hit every mark, mostly because it's one product that is trying to be two different devices. But that doesn't mean companies can't -- and haven't -- come close to creating a hybrid device that hits all the marks for consumers and businesses. The Samsung Galaxy TabPro S does a great job of acting as a notebook when you need it and a tablet when you don't, with just a few flaws along the way like a limited range of motion and a lower-powered processor, which might frustrate power users. The battery life make this a great option for those on the road a lot and its price point makes it an attractive option over the competition.